Whether you wish to announce your union in style, send invitations for your impending nuptials or thank guests making it to your big day – this custom 3.25 x 3 save the date magnet is a perfect choice. This save the date magnet is all set to enjoy long innings over refrigerator doors of your loved ones. It is going to remind them about impending event, or about the great time they had on your special day. 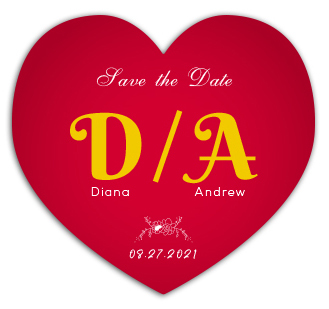 Request a quote to know price benefits that can be availed on personalized save the date heart shaped magnet.